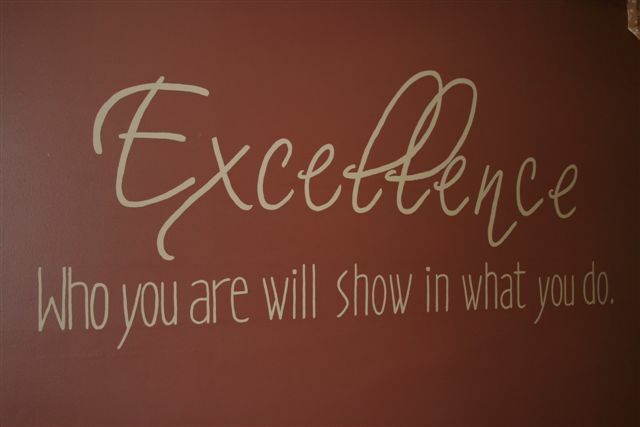 EXCELLENCE – Journey to my heart…. Who you are will show in what you do…. These words are on the wall at Visiting Angels Conference Room. I see it every morning when I walk into the office and I am reminded that every day, my work will speak to my character. I will have many opportunities with in the day to act professionally as a Director, Business Owner and Social Worker but I want all of those professional actions to be interwoven with the heart of a compassionate, strong, tender Christian woman. This is not always an easy balance to find. I have moments when I struggle with what interwoven may look like, but I am pleased to say, it comes more naturally now than it used to. Is it because I have parents who modeled this well for me, or perhaps because I have been well-educated at Holland Christian, Calvin College and WMU MSW program? Is it because I learned about ministry while on staff at Sunshine Community Church, about advocacy while facilitating international adoptions, quality of life while working for Hospice or how to grow and manage a business that is all about professional boundaries and deep endless compassion. I want to say, it is all of those things and more. It is the big and little pieces in my story. It is about the journey of recognizing I am a woman of dignity and depravity. It is about the path that God has led me on and how He has gifted my being, It is about all the many wonderful mentors and friends who have helped me to grow up and mature and to learn how to love people well. I hope and pray every day that who I am will show in what I do and as a result, that God will be Glorified! Amen. May it be so for you and me as well.